I welcomed the New Year with open arms yesterday. I set big goals and I started on some of them in late December, just to remind myself that I can start a new thing anytime. God doesn’t wait for Jan 1 to do things, why should I? Before I share those goals with you here, and before we get too far into the I-already-gave-up-on-my-resolutions many people will experience in the coming weeks, I wanted to share 12 things I’m not doing this year. It’s because if there is one thing I have learned in thirty-nine years, it’s that I can’t do it all, all the time. And more importantly, I don’t want to. It makes me a mediocre wife and mother when I over extend myself, not to mention I usually gain weight and lose patience in the process. So many of these habits are the chains that keep us bound. I put enormous pressure on myself to send cards for example, because I’m an encourager by God’s design. They make people happy and we get regular mail so infrequently anymore. I don’t want everyone to stop doing it, I may send them again next year, but it’s so freeing to just decide that I’m not doing it this year. It’s a good thing to send cards, but my resources are finite and I don’t believe it’s the best thing I can do right now. Next week I will be sharing more about my goals for 2015 and what I will be doing. I’d love to hear something you are not doing this year! I love your list!! So many of them ring so true for me. I may have to develop this manta also!! It is so easy to keep the habits we have had instead of making these changes, isn’t it?! May your 2015 be amazing! Your list is fantastic and Facebook example is so very true! This year I am not going to be attached to my phone/business and try to unplug more often. That is a fabulous not-to-do item Jill! I have been starting the habit of leaving my phone in a central place in our home, much like a landline would have been, so I’m not constantly checking it. Thanks so much for stopping by, hoping your 2015 dreams come true! I’m so glad I’m not alone Stephanie! A list of things you won’t do is probably even more useful, easier to stick to, than a list of resolutions. I’ve always been a fan of drawing the line in the sand “This far and no farther”. I have several friends who have had babies over 40 and I am so glad I am not testing my knees and back out with a little one 😉 Your analogy of the line in the sand is great, I think I went blindly running down the beach the last couple years trying to find what I was ‘supposed’ to be for a lot of other people. This year will be different for sure! Great list. I won’t be volunteering for things I don’t really want to do. But I will be sending birthday cards – something I didn’t do for years but started doing to connect with my sisters who live far away. Its working, we’re closer than ever. But I don’t send cards to just anyone. That can be overwhelming and expensive! Number 9 is great, it feels so refreshing to realize and accept who is adding negativity to your daily stream and life and take power over that by deleting them. 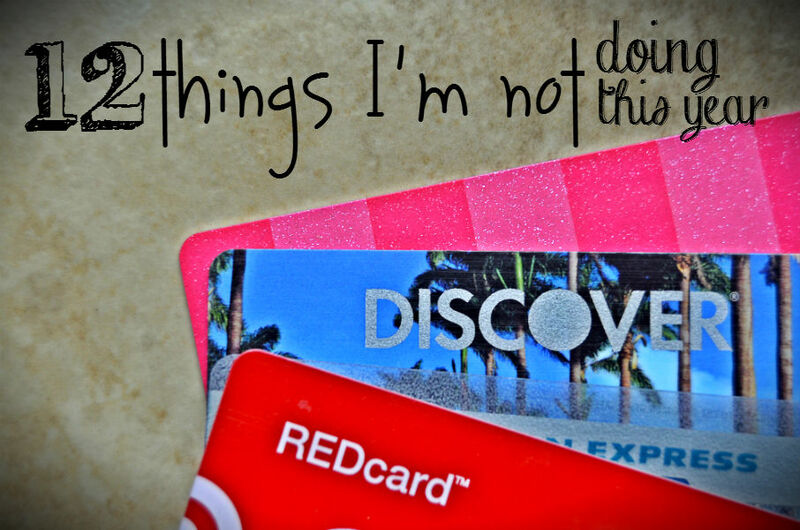 I would also like to stop using credit cards. Leave a Reply to Aimee @ Captivating Corner Blog Click here to cancel reply.